Relations between Greece and the eurozone have deteriorated rapidly in recent weeks with recriminations on both sides. As the German finance minister warns of a possible ‘Grexident’, the IMF was reportedly described Greece its most unhelpful client ever. 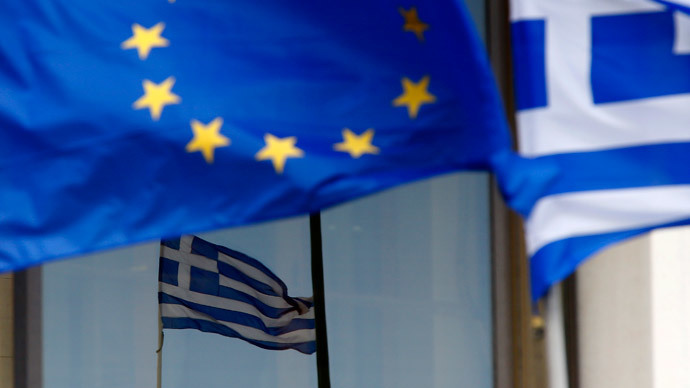 International Monetary Fund officials have told eurozone colleagues that Greece is the most unhelpful country the organization has dealt with in its 70-year history, according to Bloomberg. In a short ill-tempered conference on Tuesday Fund officials complained that Greece wasn’t adhering to the $254 billion bailout extension deal reached in February or cooperating with its creditors. European officials blame Greece for not cooperating and revealing little information on the government’s finances and other key topics in Athens, the Wall Street Journal reports. Athens refused to update European finance ministers about its plans to implement vital reforms at a scheduled teleconference on Tuesday, the Telegraph reported, citing a European official who said that Greece’s brinkmanship was "something of the last straw.” The Greek government is instead demanding European Union leaders discuss the issue at the EU summit in Brussels later this week while its creditors are already frustrated over the strained bailout negotiations. Greece is at risk of running out of cash within weeks, because it remains shut out of the next tranche of financial aid as the eurozone requires the country to stick to the austerity measures already agreed upon. Athens has to make a $370 million repayment to the Fund on Friday and refinance some $1.7 billion of short-term notes. The Greek parliament adopted a "humanitarian crisis" bill on Wednesday aimed at helping its poorest people despite apparent pressure from the European Union to halt the legislation. Prime Minister Tsipras rejected the bill was a unilateral step and said he would bring up the issue at the summit as well. Tsipras also revealed plans to push ahead with a parliamentary vote later this week to reopen the state broadcaster and offer taxpayers more lenient terms on arrears, without having been given the green light from international creditors. “There is a general feeling that the Greek side is completely out of touch with reality,” the WSJ quotes one of the EU officials. Meanwhile, concern is growing among European officials that the Greek government may end up forcing Greece out of the eurozone. Last week German Finance Minister Wolfgang Schauble warned of a possible so-called ‘Grexident’. Recent opinion polls show that Germans, who are the key creditor in the troika of lenders, are fast running out of patience with Greece. 52 percent of Germans would like to see Greece out of the euro, which is up from just 41 percent last month.